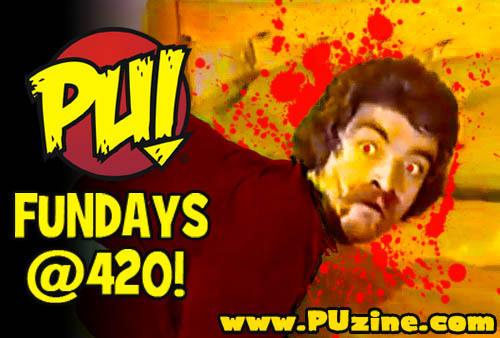 Pittsburgh Underground: Fundays At 420: 13 Takes on the Worst Death Scene EVER!!! Fundays At 420: 13 Takes on the Worst Death Scene EVER!!! Greeting again gang to more overacting than you can shake trick at (what a treat!). This weekend's 420 piece can be soley blamed on our good pal Chops Huber as he enlightened us with some so of the worst dramatic takes at 'the death scene' that we here at Pittsburgh Underground have ever seen on the screen. On September 26th of this year, this section of the film went viral on YouTube as the worst death scene ever. Although the clip is cited to have been edited slightly from the original to add the unending screams, it only made it more hilarious thus creating a frenzy of viewer parodies, each better than the last. Now in our favorite month of ghoulishly gory October, the worst things to view with this edition of Fundays at 420 will literally be the acting alone as we're sure you can smell the stink from wherever your sitting. With that said, let the reaper do his due diligence with 13 of the Worst Death Scene Ever Parodies - Enjoy!!! 13 of the WORST DEATH SCENE PARODIES EVER!!! HAVE A GREAT FUNDAY EVERYBODY!! !